One of the most enriching, forward-thinking, fastest-growing online creative communities flourishing right now is the Poetry community, especially in those scenes that center on marginalized voices — Women, POC, Neurodivergent, and LGBTQ. Poetry Spotlight is a feature aiming to showcase the work of some of the most talented creators we’ve discovered making waves on the Internet literary circles, inside or outside the mainstream. In our eighth installment, we focus on the work of Cardiff-based writer Hanan Issa. 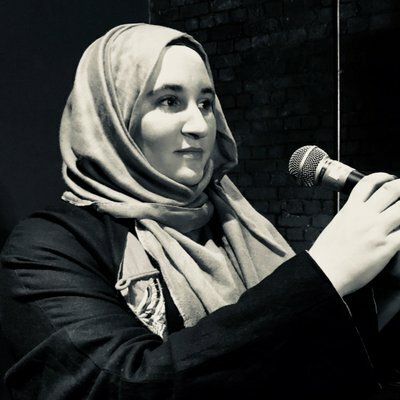 Hanan is a mixed-race writer and poet from Wales. She has performed at the Wales Millennium Centre’s International Women’s Day, at numerous events across the UK, as well as on BBC Radio Wales’ Arts Show. She has appeared on both major Muslim TV networks (BMTV and Islam Channel). Her work has been published in Banat Collective, Hedgehog Press, SISTER’s magazine, sister-hood magazine and MuslimGirl.com. Her winning monologue was featured as part of the Bush Theatre’s Hijabi Monologues project in 2017. She is also the co-organiser of Cardiff’s first BAME open mic series entitled ‘Where I’m Coming From’. In May she will be on the judging panel for Warwick university’s ‘Two Chairs’ poetry competition. She is also currently working on a film project in partnership with Film4. The cup is the first step. while the talk slices up an Empire. contained in its dried leaves? seeping bitterness into boiled water. spilling along the Silk Road to Tescos. Merging bitter matcha with sweet shai, soaking into bara brith raisins overnight. Cultures and languages permeate life, weaving through our flow of experience, iridescent in the chaos. just like the road signs the talking man had ignored. He wrote down my name as the spider crept accusingly along his shoulder. and the ambulance screamed its presence just as my friend fainted. And here’s a video of her monologue “With Her Back Straight”, performed by Nadi Kemp-Sayfi and directed by Milli Bhatia, for Hijabi Monologues London at the Bush Theatre.